Walmart is launching video streaming service Vudu on the iPad today which will bring 20,000 instant movies and TV shows available for downloading and viewing. What’s unique about Vudu launching on the iPad however is that it’s not launching as an app. Instead, Vudu is launching as a mobile website that is compatible on the iPad, and thousands of other mobile devices. I’ve written before how I believe the day is soon approaching when we will no longer be restricted with apps. Instead, developers will build mobile versions of their sites and applications that can be accessed on literally every web enabled mobile device throughout the world. 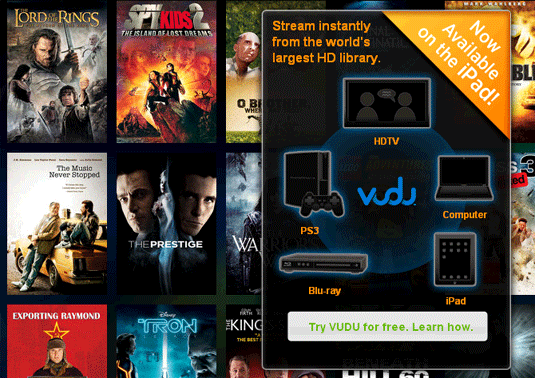 You simple point your mobile browser to Vudu.com and rent or buy your videos. Once purchased, the videos can viewed online or through more than 300 devices including Internet-capable HDTVs, Blu-ray Disc players and the Sony’s Plastation 3, according to Walmart. With Apple charging 30% for content purchased through apps, companies like Walmart, Amazon, and others are finding ways to build applications to where they don’t have to share such a large percentage of revenue – Vudu.com is a great example. Another great example of a mobile site that is not restricted to an app for particular, but rather can be accessed on thousands mobile devices, is the daily deal search engine ListYourDeals.com. The developers of ListYourDeals decided to also avoid the constraints of having to build an app for each device and then share revenue with Apple. Again, this is trend I believe we are going to be seeing more of in the future.